***THIS GIVEAWAY IS NOW CLOSED. In the words of Red Hot Chili Peppers: Give it away, give it away, give it away now! I'm very excited to write this post. It's the first of many giveaways this year. 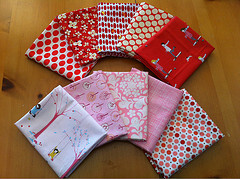 In celebration of Valentines Day, I'm giving away 5 FQ's of my favorite reds and 5 FQ's of my favorite pinks. That's 2.5 yds of fabulous fabric. Here's how this lovely stash builder can be yours. Leave a comment about what you like (or dislike) about Valentine's Day. If you decide to become a follower, leave a 2nd comment. If you're already a follower, let me know and it counts as 3 entries! :) International folks are always welcome! All of the fabrics are wonderful for Valentine's Day...love them! I agree with Rebecca - the best part of the Day is the chocolate! It is like on Valentine's Day - chocolate has no calories. That being said... yes we will be going out to dinner haha. CHOCOLATE!! Dark chocolate dove hearts, need I say more? I love V day because I love pink! I dislike Valentines Day b/c once you become an adult it's basically a couples only holiday. And couples already have it better than the rest of us!! Love those fabrics! Thanks for the chance to win them. I am not crazy about Valentines Day, its a Halmark holiday. 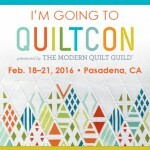 I follow you - and drool over your fabulous fabric stash! I love your fabric choices Jen! Thanks for the giveaway! I like V Day because as parents of four little ones, we need the excuse to get out. We don't do gifts or chocolate (though I wish he would on the chocolate!). But, this year he is working that night. So, I am hanging with a girlfriend! Cheers! Beautiful reds and pinks! Thanks for the giveaway ~ I love Valentine's Day because... what's better to celebrate than love??? 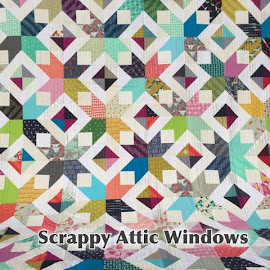 I've been following your blog for a while now - after seeing your amazing DS Quilts star quilt on Flickr! W.O.W. What I love about Valentines Day is you can show your love to everyone - not just one special person - although that is nice too! I followed you in reader, but now with GFC. thanks! My fave part of Vday is the sweetest dinner my husband and daughter make for me! They wear aprons, deck the dining room like a restaurant and spoil me with wine, appitizers and a "gourmet" fancy dinner! It's my favorite part of the year- they are too darn cute!! New subscriber to your blog, love the fabrics. I am a new subscriber to your blog - Thanks so much for the great giveaway! Great fabrics! My stash is pretty light on reds and pinks... I always thought Valentine's Day was just a Hallmark holiday, but then a friend of mine declared his love for me on Valentine's Day and we were married about 2 years later. So, now I love it :) Thanks! I hate the every feels like they have to be extra lovey on that day you should be that way always :) I love my chocolate covered strawberries that my husband gets me though I am a sucker for them. I love the chocolates, dark chocolate. I am not a v-day hater, but lots of the cutesy stuff you see around pinterest is pretty ugly to me! But I am a single girl so maybe I have a negative view! I do love some of the funny cards they bring out. I am a follower in my google reader! I love chocholate, Lindt chocolate !!!!! For me Valentine's is ALL ABOUT THE CANDY!! Beautiful fabrics!!! I think Valentine´s day has a commercial purpose. I don´t need to show my love only this day. I love Valentine's, but wish it were more universal -- you know, wishing everyone a happy day, instead of just family and sweetheart! I am a happy brand new follower! I like that it's a reminder to celebrate your love for someone. Not necessarily a partner, but for great friends as well. I am a follower and thanks for the chance at this lovely fabric! Pretty fabrics. I am glad to have found your blog. I love getting to know other bloggers. I am not wild about Valentines Day and the emphasis on Romantic Love. But I love my kids and enjoy spoiling them! Oooh, those are some very luscious fabrics! Welllll... Valentines day, for me, has never been about romantic love. Not that it can't include romantic love! But for me, Valentines represents love in all forms- love of family, love of life, love of nature. What I like about Valentines day is that it reminds us to love something, anything, wholeheartedly. What I DISLIKE about Valentines is that I do NOT receive nearly as much chocolate as I would like! I am your newest follower! Thank you for the chance to win! I love Valentines Day but what I dislike about it are the expectations that come with it. There's too much pressure for that one day! Oooh, such a lovely stash. I have to admit my fave thing about Valentines day is the heart shaped chocolates! not a fan of valentines day...dont like that it singles anyone out...or makes them feel left out. it is fun to celebrate and make my kids feel special though. your have selected a very sweet stash bundle! thanks for a chance. Wow, love those pinks and reds! I've never been a huge Valentine's Day fan, but now that my daughter is 5, and she is so excited, it is pretty fun. She's making handmade cards for everyone in her class! Thanks for the chance to win. Great fabrics! I love them all! I don't like how Valentine's day has become so commercial! I used to love Valentine's day, but now I don't really care too much. I'd rather have some extra attention all year long. I'm already a follower! Thanks for hosting this giveaway. I'm not that big of a fan of Valentine's Day anymore. I think it has gotten too commercial and I would rather my husband buy me flowers and chocolates spontaneously because he wants to. I love all the fabrics you chose...I'm a RED lover! What I like about Valentine's Day is corresponding with friends...my gift to them is a nice newsy snail mail letter decorated with hearts all over that they receive in their mailbox close to Valentine's Day! Thanks for the giveaway. I just signed up to follow via email. Hi.. I am a first time visitor for this site. For me Valentines Day is very special as we have a defined occasion to re-look at our love.. a time to celebrate our love and make it even more memorable than each day that we share together. I dislike Valentine's because I think it's just a "hallmark" holiday anymore. Maybe we need several of them sprinkled throughout the year. Wonderful bundle Jenn!! All the fabrics are really cute. Well, I don't like too much Valentine's day, because is a commercial day (it makes sense? ), just for spend money. Everyday you've to show your love for your husband/wife not just one day. I am a new follower. Looking forward to seeing your work! My first comment seems to have disappeared, so I'll try again. I agree with Elena, Valentine's Day seems to be a commercial exploitation of love, designed to guilt us into opening our wallets. You can show your love (for your significant other or chocolate) any day of the year! I dislike how commercial it is. I like that it's a day to appreciate the people the people you love! What a lovely giveaway - so generous! I love getting to decorate the house with red and white hearts, it's a big pick-up after having to take down the Christmas decorations and having to face the winter weather. Thank you for such a lovely giveaway. cute fabric! I love that we get to celebrate love!! I love that Valentine's Day is my Anniversary with my amazing husband! Hubby and I actually don't celebrate Valentine's Day, but we have just had both of our birthdays in November, Christmas in December, and our anniversary in January so we just need a break come February! I do have to do things for the kids though! I love that pink is everywhere and forcing me to get a card or something sweet for a loved one is really kind of nice. My friends and I have a fake 5k every Valentines Day called the Grumble Run - where we walk/run/grumble around town for about 5k. Then in the evenings we have a pro-anti-valentine's day party. It is a fun way to make the day memorable and not necessarily about couples. How cute your choice of fabrics are. I like Valentines Day when I am in a relationship. I don´t like it at all, when I am not! Thanks for the giveaway, Jenn! Such pretty fabrics. Such cute fabrics! I'm not a huge Valentine's Day fan, mostly because it just feels so commercial. But, I do love that my wedding anniversary is just a few days later! Those are such lovely fabrics - I love the reds! Rampant commercialism aside, I kinda love it. If only for the flowers. If a boy thinks outside the box and brings me freesias, he's a winner! i love that I met my husband on Valentine's Day. and I love that we go to Chick-fil-a every year.